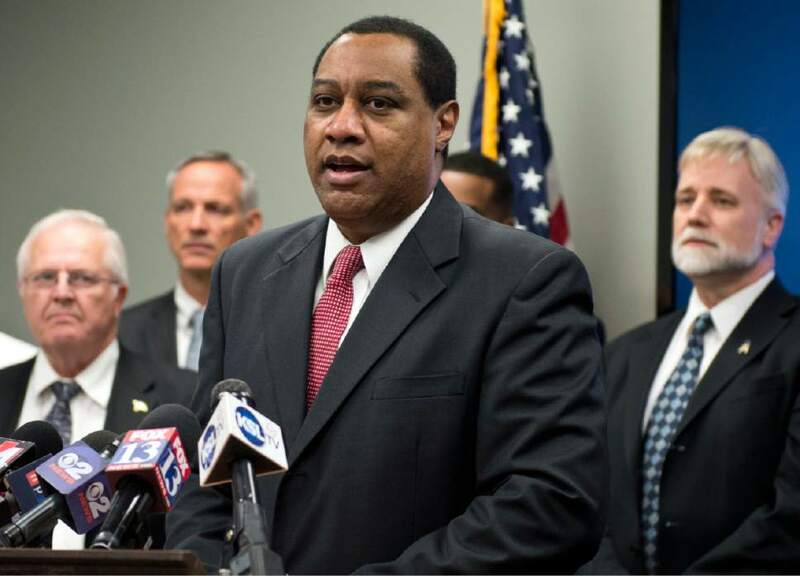 Politics • State GOP leader alleges "thuggish behavior," offers no evidence. Chris Detrick | The Salt Lake Tribune U.S. Rep. Jason Chaffetz, R-Utah, speaks to a question during the town-hall meeting in Brighton High School Thursday February 9, 2017. 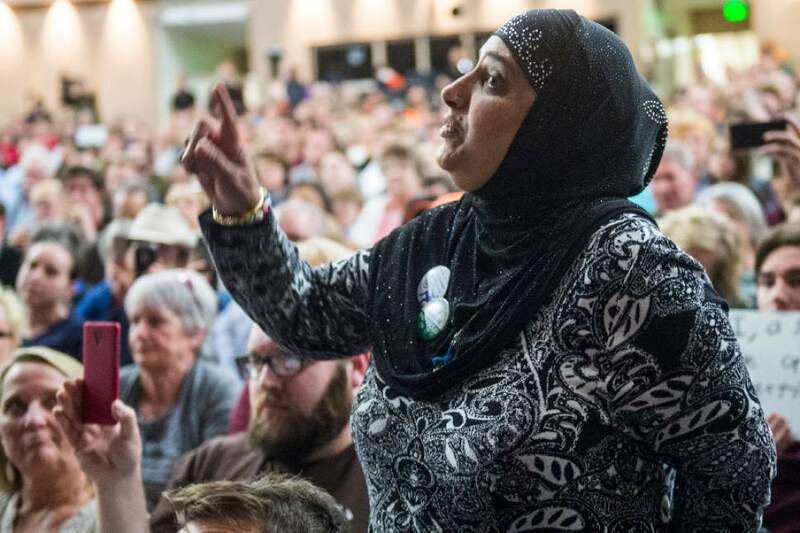 Chris Detrick | The Salt Lake Tribune Noor Ul-Hasan asks a question during the town-hall meeting with U.S. Rep. Jason Chaffetz, R-Utah, in Brighton High School Thursday February 9, 2017. Chris Detrick | The Salt Lake Tribune U.S. Rep. Jason Chaffetz, R-Utah, speaks during the town-hall meeting in Brighton High School Thursday February 9, 2017. 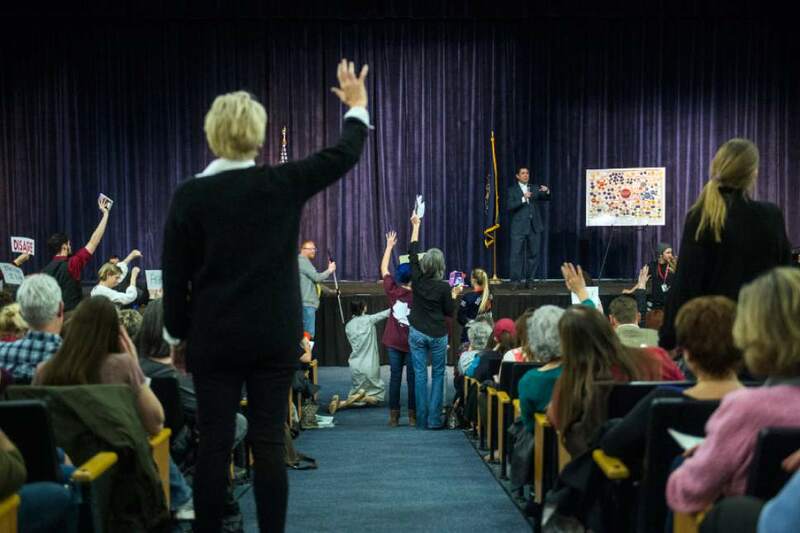 Chris Detrick | The Salt Lake Tribune Members of the audience hold up signs as U.S. Rep. Jason Chaffetz, R-Utah, speaks during the town-hall meeting in Brighton High School Thursday February 9, 2017. Chris Detrick | The Salt Lake Tribune Teacher Chelsie Acosta asks a question during the town-hall meeting with U.S. Rep. Jason Chaffetz, R-Utah, in Brighton High School Thursday February 9, 2017. 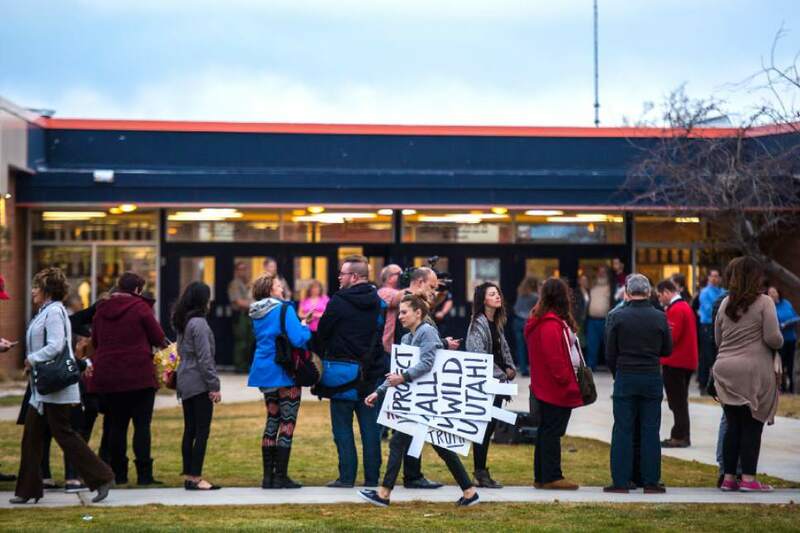 Chris Detrick | The Salt Lake Tribune Crowds of people line up before the town-hall meeting with U.S. Rep. Jason Chaffetz, R-Utah, outside of Brighton High School Thursday February 9, 2017. Chris Detrick | The Salt Lake Tribune Crowds of people line up before the town-hall meeting with U.S. Rep. Jason Chaffetz, R-Utah, outside of Brighton High School Thursday February 9, 2017. Trent Nelson | Tribune file photo Utah Republican Party Chairman James Evans says it was legitimate for the GOP to send out a fundraising email attacking Doug Owens late father, Rep. Wayne Owens, over the nearly quarter-century old House banking scandal. 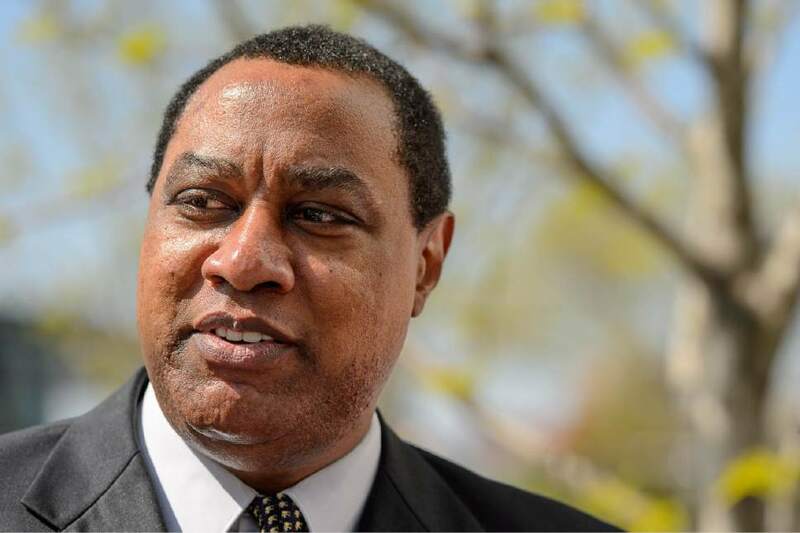 Lennie Mahler | Tribune file photo Utah Republican Party Chairman James Evans, center, is seeking re-election to the GOP's top post. 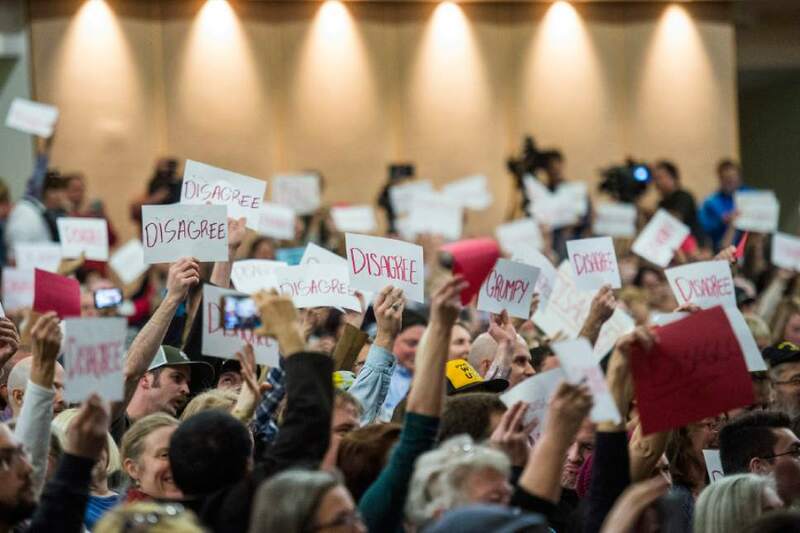 Chris Detrick | The Salt Lake Tribune Members of the audience hold up signs as U.S. Rep. Jason Chaffetz, R-Utah, speaks during the town-hall meeting in Brighton High School Thursday February 9, 2017. Chris Detrick | The Salt Lake Tribune U.S. Rep. Jason Chaffetz, R-Utah, speaks during the town-hall meeting in Brighton High School Thursday February 9, 2017. 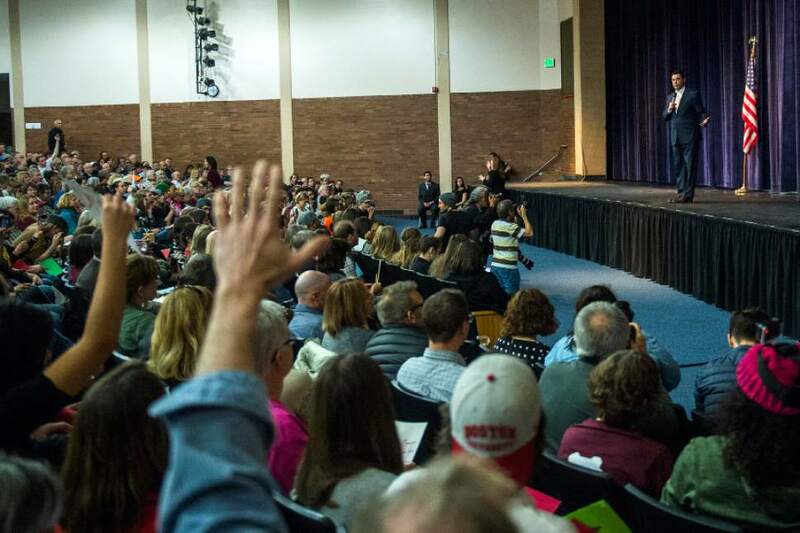 The state&apos;s congressional leaders should skip or delay hosting town-hall meetings for their own safety after the "intimidation and violence" at one held by Rep. Jason Chaffetz last week, alleges Utah Republican Party Chairman James Evans. "There&apos;s a pattern here that the political left, primarily the Democratic members and organized affiliates, lost at the ballot box and, as a result, they&apos;re taking the fight to the streets," Evans said at a hastily called news conference Thursday. The chairman pointed to several supposed instances of "thuggish behavior" by the roughly 2,000 attendees of the Feb. 9 town hall at Brighton High School  noting that "several people were arrested" and one group rushed at police officers. Three Salt Lake Tribune staffers who attended the event did not witness acts of violence or threats to security. 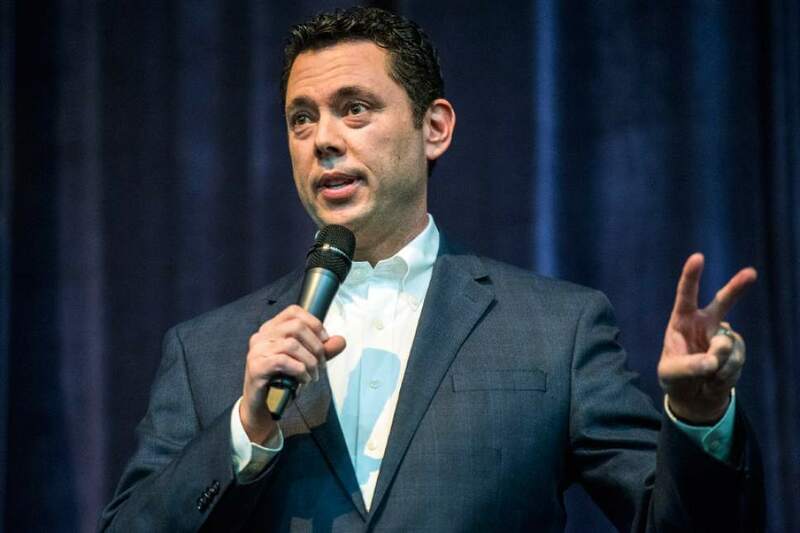 Cottonwood Heights Police Chief Robby Russo earlier told the newspaper that one person was ticketed for causing a public disturbance and a small group of people also attempted to find Chaffetz&apos;s car, which was not at the school. The auditorium space for the event was capped at 1,080 people, leaving about the same number outside. Those who didn&apos;t make the cut to get inside rallied and chanted, "but they were lawful," Russo told The Tribune. Evans also cited an incident in California in which a 71-year-old congressional staffer apparently was hospitalized after being knocked unconscious by protesters. According to police accounts, that&apos;s not what happened. Officers say the woman fell down "by accident" during some commotion in the office; they denied that she went to the hospital. 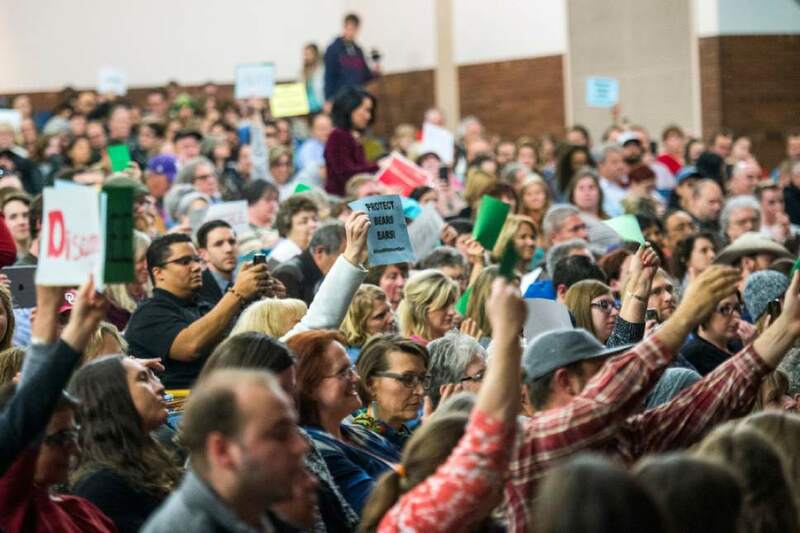 The Utah Republican leader suggested there was a "concerted effort" by the state Democratic Party and Utah Indivisible, a local progressive resistance group, to stack and "hijack" the meeting with residents who do not live in Chaffetz&apos;s district and do not agree with the congressman&apos;s policies. He did not provide evidence of that assertion. "If you want me to prove this in a court of law," Evans said, "that&apos;s not going to happen. This is the court of public opinion. There&apos;s no question they&apos;re working together." Both groups denied that was the case. Peter Corroon, chairman of the Utah Democratic Party, said there was no organized push for attendance  though the party did send to members an email with information on the event, as did the Salt Lake County Republican Party to its members  and residents have a right to voice concerns to their congressional leaders, especially when they&apos;re angry or upset. "We do not condone anybody being disruptive or violent or disrespectful," Corroon said. "But we believe that our congressional representatives should listen to all of their constituents  not just Republicans." 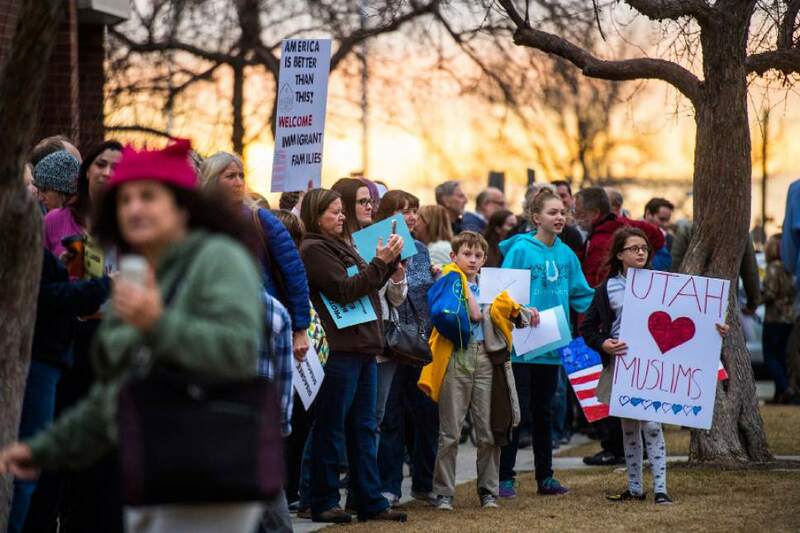 The founder and leader of Utah Indivisible, Courtney Marden, said "there&apos;s no merit" to Evans&apos; assertion that the crowd was "manufactured." The progressive group is nonpartisan, she said, and does not endorse political parties. 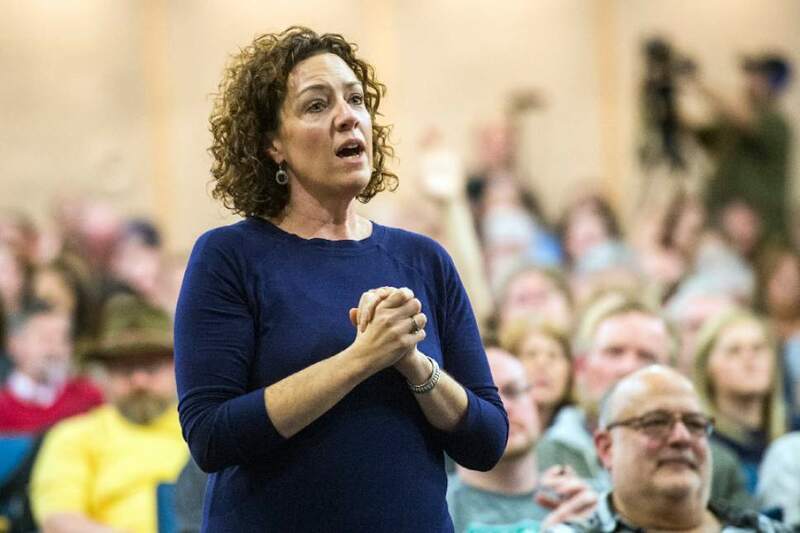 "I think completely shutting the door to future meetings and blaming it on the so-called violence of the town-hall participants … that&apos;s cover for not wanting to meet with your constituents that have different views from you," she said. The crowd at Chaffetz&apos;s event was rowdy and raucous  at times shouting over his answers and urging him to "do your job." They booed when he mentioned President Donald Trump, and they often cut him off midsentence. Marden says that was a display of passion and pent-up energy more than violence or intimidation. In an interview with The Tribune on Thursday, Chaffetz said he happens to "disagree with what James Evans said and how he said it." "Everybody needs to take a deep breath," the congressman said. "It was not a violent meeting. I think that&apos;s an exaggeration." Though there were a "handful of people who were trying to incite violence" by wearing masks and flaunting weapons  which police confirmed  Chaffetz said those aren&apos;t reasons to call off future in-person events. "Of course we&apos;re going to continue to interact with constituents. I need that," he said. "I believe I have a duty and a need to hear from everybody in my district. That will take on a variety of forms, but we&apos;re not going to shut that down." The GOP congressman backed down Monday from earlier claims that the crowd was infiltrated by paid protesters. "The overwhelming majority of people there were Utahns; they weren&apos;t paid," Chaffetz said earlier this week. "But I do believe there was a concerted, national effort, some of which was paid, to get people there to cause a problem." Evans suggests that local resistance groups rallied to fill seats with "outside agitators" to prevent people from Chaffetz&apos;s district from asking questions: "It was all in their playbook." While he supports constituents&apos; right to disagree with congressional leaders, Evans says disruption and disorder will not be tolerated. The party leader proposed that town halls be screened to allow only members of the corresponding congressional district and turn away all others. "People who are not from that congressional district would need to go to their respective congressperson," he said. "That&apos;s how it works." Until security can be improved  though there were at least 20 officers at Chaffetz&apos;s town hall last week  Evans says congressional leaders should hold online conferences. In these tele-town halls, callers are screened and muted after questions or comments so the official can speak without interruption. Evans also suggests using smaller venues that are easier "to control" for safety. "Given this current behavior, it is just unwise to hold town halls without an appropriate level of security," he said. Corroon believes that&apos;s an excuse for leaders to dodge face-to-face interactions with residents in which they&apos;re put on the spot and held accountable to provide answers in the moment. "Hiding behind a telephone or hiding in the shadows is no way to represent their citizens," he said, later adding: "If our congressional representatives held more meetings, the meetings would probably be more peaceful."